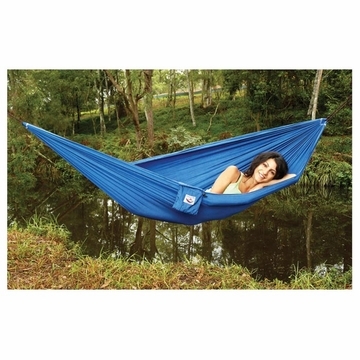 At only 13 oz, the Ultralight sets the standard for hammock portability and comfort. So small it fits into the palm of your hand, Bliss Ultralight folds out into a fully relaxing, floating bed. Featuring soft and breathable nylon parachute material and complete with its own rope, the Ultralight allows you to enjoy the pleasures of a hammock anywhere your imagination takes you. Dimensions: 4'6'' x 7'11". Wt: 13 oz.